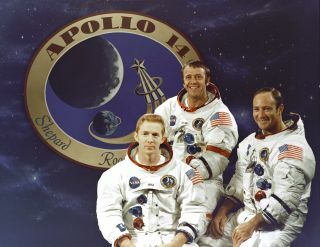 The Apollo 14 crew: Stuart Roosa, Alan Shepard & Ed Mitchell. Apollo 14 was the third human mission to land on the moon, and the first one since the Apollo 13 mission that experienced a dangerous explosion in space before the crew was returned safely to Earth. NASA made changes to the Apollo spacecraft design before Apollo 14 lifted off on Jan. 31, 1971. Today, many people best remember this mission as the one where an astronaut hit golf balls on the moon, but the crew also had several other adventures. The team searched for evidence of an asteroid that carved a large crater in the moon and fought glitches and false alarms as they made their way to the Fra Mauro highlands. Their colleagues at NASA good-naturedly referred to the Apollo 14 crew as "the three rookies," because the team had only a few minutes of accumulated space experience among them. Astronaut and commander Alan Shepard was selected among the first group of American astronauts in 1959. He was the first American in space, making a 15-minute-and-28-second suborbital hop in 1961 aboard Freedom 7. NASA assigned him to the first Gemini mission, but Shepard developed symptoms of Ménière's disease, a disorder of the middle ear, and had to stop flying per his doctor's orders. In 1968, Shepard underwent risky surgery to alleviate his symptoms; the surgery was a success, and he was reassigned to flight status. Lunar module pilot Edgar Mitchell, selected as an astronaut in 1966, was one of the few astronauts at the time who had a doctorate. In the U.S. Navy, he not only flew planes, but also gave advanced mathematics and navigational lessons to aviators who were astronaut candidates. After five years at NASA, Mitchell received accolades from his peers for his knowledge of the lunar-landing module, which was likely factored in to NASA's decision to put him on Apollo 14, his only space mission. Stuart Roosa, a former Air Force fighter pilot, joined NASA in 1966 and was the command module pilot for Apollo 14. He served as CapCom (the person who communicates with astronauts during a mission) for the Apollo 9 mission, and impressed NASA with his ability to help the astronauts after crew member Rusty Schweickart fell ill. Roosa became the first Apollo astronaut assigned to a flight crew without having completed a backup assignment first. Apollo 14 was Roosa's only space mission. The three men were initially scheduled to fly on Apollo 13, but they agreed to take on a later mission so they could receive extra training. This was especially useful for Shepard, who had just resumed active duty in the Navy. Apollo 14 launched smoothly, aiming for the Fra Mauro highlands, a hilly region of the moon that Apollo 13 had hoped to reach. However, the Apollo 14 astronauts ran into trouble as they were preparing to leave Earth orbit. One of their required tasks was to dock the command module Kitty Hawk against the lunar lander (or lunar module) Antares to fly the two craft to the moon, but the docking latches didn't work. After a suggestion from Mission Control to fire Kitty Hawk's thrusters hard and push the ships together, the latches locked successfully. Landing on the moon didn't come easily for the astronauts, either. Antares' radar wasn't working until the last minute. The radar on Antares needed to work to satisfy NASA's rules for landing on the moon; otherwise, the mission would be aborted. Once the radar was functioning properly, Shepard made an on-target landing. Shepard's first words when he walked on the moon's surface were, "It's been a long way, but we're here." Mitchell scrambled down after him and the two immediately got to work setting up experiments on the lunar surface. For the first time, the crew had a small handcart to help them carry rocks and equipment around the moon's surface. Sitting 69 miles (111 km) above Mitchell and Shepard, Roosa took pictures of the moon as he worked through his assigned list of scientific experiments. On Feb. 6, 1971, Apollo 14 astronaut Alan Shepard became the first person to play golf on the moon. He smuggled a makeshift golf club head onto the spacecraft inside a sock. The first ball he hit veered into a nearby crater, but with a solid second swing, the next ball soared for "miles and miles and miles" in the moon’s microgravity. Here, Shepard stands by the Modular Equipment Transporter, a cart for lugging equipment on the lunar surface. Apollo 14's prime geologic target was Cone Crater. The crew planned to climb the slope, reach the rim — which was 300 feet (91 meters) above the landing site — and then look for rocks that could have flown up from the moon's bedrock after a meteor smashed into the surface millions of years earlier. The astronauts found the climb harder than expected. Rocks littering the slope forced them to carry the cart, and the steep climb meant they had to rest often. Mission Control asked the astronauts for updates on how close they were to the rim; the astronauts guessed they were nearby, but it was hard to say for sure without landmarks to help them estimate the distance. Eventually, Shepard and Mitchell ran out of time and were forced to move on. When the pictures were analyzed later, geologists estimated the astronauts missed the rim by a mere 100 feet. Before leaving the moon, Shepard performed an entertaining stunt for the television audience watching from home. He brought a 6-iron with him as well as a "little white pellet that's familiar to millions of Americans," he said to the viewers back on Earth. In front of the camera, he hit one golf ball into a nearby crater and a second one that went "miles and miles and miles," according to Shepard. But in reality, neither ball traveled more than a mile, according to collectSPACE editor Robert Pearlman. Apollo 14 splashed down in the Pacific Ocean on Feb. 9, and NASA began its next set of lunar missions – all of which featured lunar rovers. NASA flew three more crewed missions to the moon, with the last one leaving in December 1972. Kitty Hawk's current location is the Kennedy Space Center Visitor's Center near Titusville, Florida, while Antares' upper stage crashed on to the moon on Feb. 7, 1971. After Apollo, NASA focused its work on Earth science through the space shuttle and International Space Station programs. The agency may return humans to the moon in the near future, though, as the Trump administration has directed NASA to prioritize human lunar missions in the coming decade. NASA is in the design phase for a potential lunar space station, called the Lunar Orbital Platform-Gateway, and is constructing a spacecraft for deep-space voyages, called Orion.